CAUTION: Chocolate will melt in the heat! To minimize this we highly suggest using Next Day service when shipping to warmer climates (75 F or above). All Chocolate is shipped at your risk. Shipping Chocolate & Heat Sensitive Items Policy. Original Peanut Crunch 3 oz. Cinnamon Butterfly Cookies .82 oz. Lindt Gold Chocolate Bunny 3.5 oz. 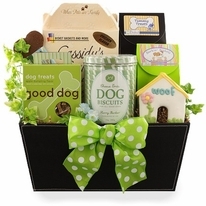 Send Easter greeting to both your family member or friend and their trusty side kick the dog they love so much. 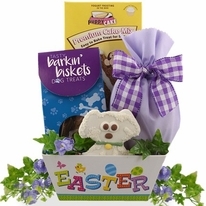 Our Easter basket for them is filled with treats they both will enjoy. The beautiful green handled metal bucket is large enough to be reused around the home or office. It can hold rolled towels for the bathroom, magazines in the living room, dog toys for Fido, a stack of diapers and ointments for the baby and the list could go on. 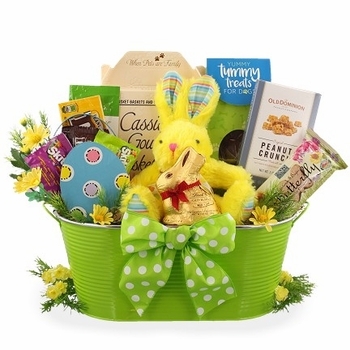 Click on the Details tab for a complete listing of what�s inside. 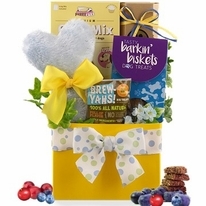 See shipping tab for suggestions when shipping this gift to warmer climates (75 F or above).